coming back again is drawing near." at Cokesbury United Methodist Church. His love, comfort and grace is received through worship. Participants are inspired to go forth and live a daily Christian life. We gather to worship God together at 11:00 am each Sunday. 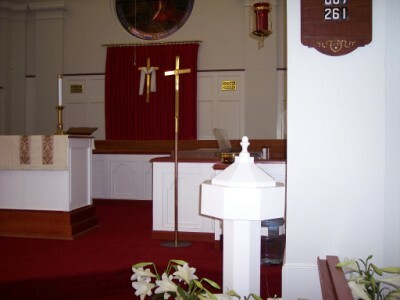 Our worship style is best described as relaxed traditional. Nursery care is provided for all infants and children ages 3 and under. Our nursery is staffed by trained volunteers. Each worship service offers a message directed toward the children, and Children's Church is offered for ages 4-7 for the last half of the service. Join the special activities and worship experiences for children, youth, and adults. All professing Christians are welcome to participate and celebrate Holy Communion. As United Methodists, we recognize God's presence in the elements and the importance of this sacrament as a means of grace to all. A warm friendly congregation is guaranteed. Come; join us in joyful worship and celebration each Sunday at 11:00 am to praise Christ, hear His Word and share His love, comfort and grace. Guests are always welcome. We invite you to make Cokesbury your church home. There is a place for you at Cokesbury!